It’s this time again for another tribute entry and it’s before April 1st. It’s been 8 years since Leslie Cheung has left its fans and admirers. It’s always been an opportunity to blog about him and even play his music on the radio. The things I left out on the radio show were the accolades of awards he’s won from his music and from the movies and how much of an impact he’s had in Hong Kong. Aside from the tribute, I played the some of the winners of the Juno Awards. Arcade Fire is definitely on a roll for 2011 as it’s won awards from the Grammys, Brit Awards and Canada’s own Juno Awards for their album, The Suburbs. As it seemed like Drake was snubbed, the big surprise would have to be London Ontario’s Shad as he won a Juno Award for Best rap recording. Shad is another artist on a roll since last year when he released TSOL. All I can say is congrats to both of them. Without further ado, there’s two options to listen to my radio show, there’s the entire show and there’s one for the Leslie Cheung tribute. The music playlist via CKCU-FM’s website is at this link. The Wild 10 Countdown entry is at this link. If you think Ottawa does not have a fashion scene, think again! It does and this past weekend was no exception as Ottawa Fashion Week rolled on at The National Gallery of Canada. It is my second time to attend the event as I went for one night for the 2010 edition. This time, I brought along my co-host, Lauren to the event. Hopefully we will chat about the event for Wednesday’s radio show on CKCU-FM. The showing from local designers were pretty good. Pretty stylish and unique. I do forget that the designers are based in Ottawa and some of their designs are very creative and engaging. I’m not considered a fashion expert, I’m trying to enjoy the events happening in Ottawa. Saturday’s event was the most important because there’s been a lot of talk about Rachel Sin, as she’s been doing pretty well in the Ottawa fashion scene. Oh yes, it was nice to meet some bloggers at the event. Kudos to you. The bloggers I saw around were Pop Champagne, Dernier Cri, The Fashion Keeper, and Your Sweet Bippy. The funny thing for Saturday’s event was grooving and head-bopping to certain songs. In a way, I got distracted with the music than watching the models on the runway. Speaking of music, I got to see some of the usual Ottawa musicians perform before the start or during the fashion show. They were Scary Bear Soundtrack, Adam Saikaley (formerly on CBC Radio’s Bandwidth) and May-Jun. Here are some photos from Friday and Saturday. I don’t have the designer’s names by memory. Hopefully some of the fashion bloggers will know it. I apologize with the image quality because I haven’t used a D-SLR camera in awhile. I had the opportunity to talk about attending Ottawa Fashion Week in the second hour of WildWorks. It was good to have my co-host, Lauren, join me at the fashion show and experience events in Ottawa. I forgot to mention the name of the designers on the podcast edition. I did mention some of the Ottawa-based designers on the live show. As usual, I was joined Erica and Digory as they provided their small jokes about having to wear “nice” clothing. I gave a shoutout to the bloggers (entry above) whom I saw at OFW. That’s my thanks to you. I should not forget about the songs I played throughout the show, as I am still hooked on The Naked and Famous, Lykke Li and Radiohead. Also on the radio show, I gave a shoutout to RTHK’s Ellie Davis as she will be interviewing MGMT for Saturday. The band will be performing in Hong Kong on March 30. I am slightly jealous that she will have an opportunity to see the band. You can listen to the radio show at the bottom of the entry. March 24 update – I guest hosted for Fundamentally Sound on Thursday from 12-2pm. The playlist is at this link. That’s right, I tried to make it a bit secretive on who I was going to air for the interview segment for the March 16th radio show at CKCU-FM. I did Twitter and Facebook a few people that I got to interview George Stroumboulopoulos. As written from the last entry on the Genie Awards, there’s no need to summarize my experience. Today’s radio show was not too bad but the recording for the podcast version was held in a different location and you will notice a bit of difference in the sound. Radio Camp is happening at the station because of March Break for elementary and high school students in the Ottawa area. Also on the show was another interview with Montreal’s Young Galaxy as they were in town on the weekend embarking on their tour. The band is back with a new album, Shapeshifting and they have new members. So far, they are sounding amazing and it was privilege to see them live again. Album pick for week of March 16. It finally came out and it could be considered a release for 2011 but originally released in September 2010. It’s none other than Passive Me Aggressive You by the New Zealand band, The Naked and Famous. I have been playing them a lot. Expect to hear other tracks aside from Punching In a Dream and Young Blood. Without further ado, you can check the playlist at this link. The Wild 10 Countdown summary is at this link. Don’t forget to listen to the show or the interviews. Apologies on combining Wednesday’s radio show and The Genie Awards all in one entry. I did not want to do back to back blog entries. March 11 update – Another apology for posting the photos late because I only had the iPad with me and the WordPress app for iOS was not keen on the formatting. Sort of live blogging over on the iPad but it is slightly failing on me. Using Safari on the iPad to get started. It is 3:35pm and hanging at the blogger zone at The 31 Genie Awards red carpet. 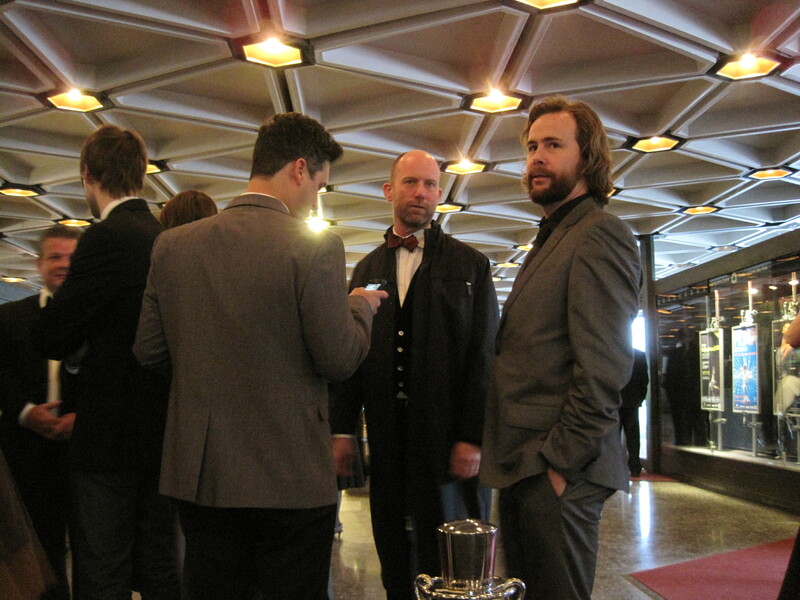 Live Blogging at the Red Carpet for the 31 Genie Awards. Almost 3:45pm and there’s not much activity happening. 4:08pm. The red carpet has started. Strombo is here. 4:13pm. I finally got to meet George Stroumboulopoulos and had a short chat with him. 4:16pm. Just saw Remy Girard of InSecurity and Alan Hawco from the CBC’s Wednesday show, Republic of Doyle. 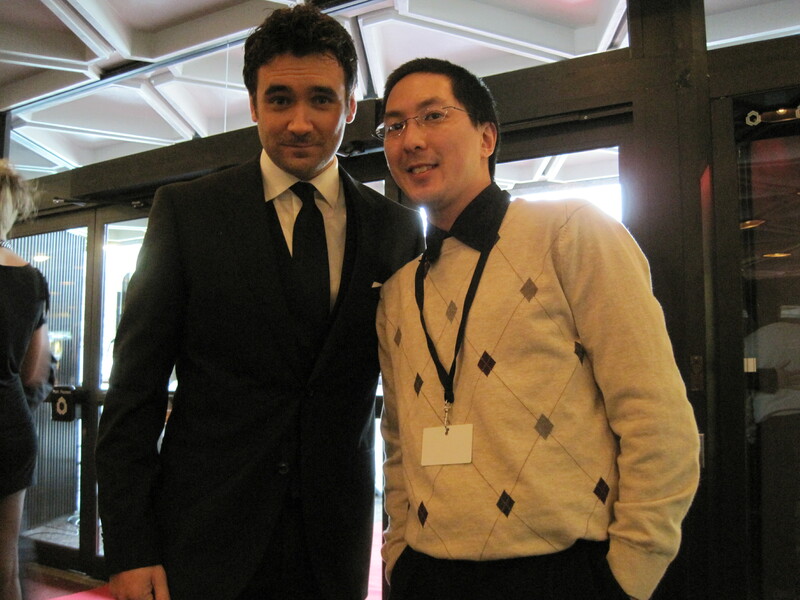 Here’s the photo with Alan Hawco. 4:30pm. Got to see Shannon Tweed, Brett Wilson (from Dragons’ Den) and Kristin Kreuk. Pictured with Wilson. 4:33pm. 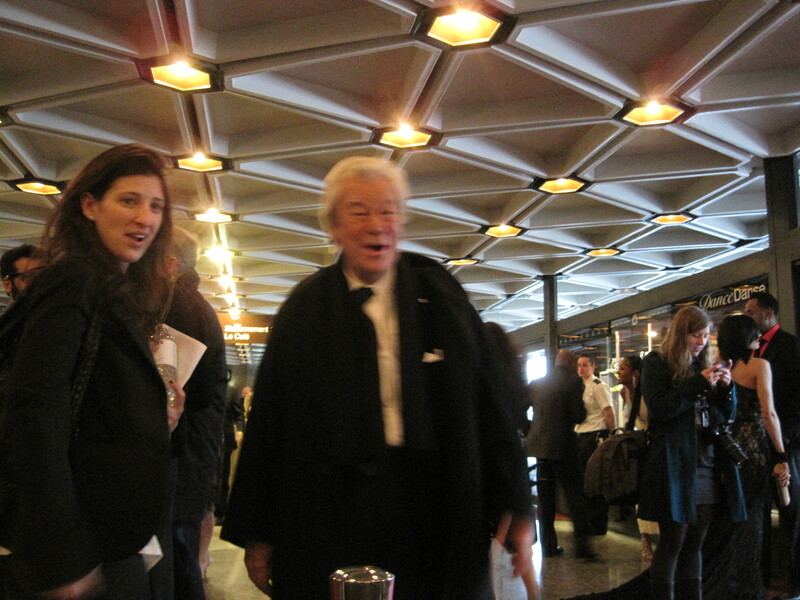 Gordon Pinsent just went to the Blogger Zone and said hi. 4:38pm. Gilles Ducceppe and the director of Incendie walked to the red carpet. 4:42pm. It was great to see Elliott Brood on the red carpet (photo shown). 4:50pm. The CBC head brass arrive on the red carpet. 4:54pm. 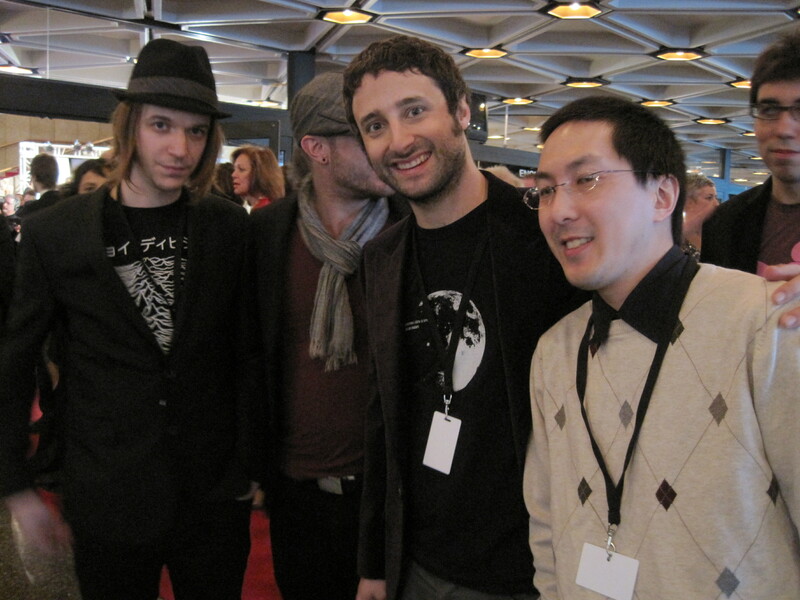 Got to see the 2010 Polaris Music Prize winner, Karkwa and kindly approached us at the Blogger Zone table. 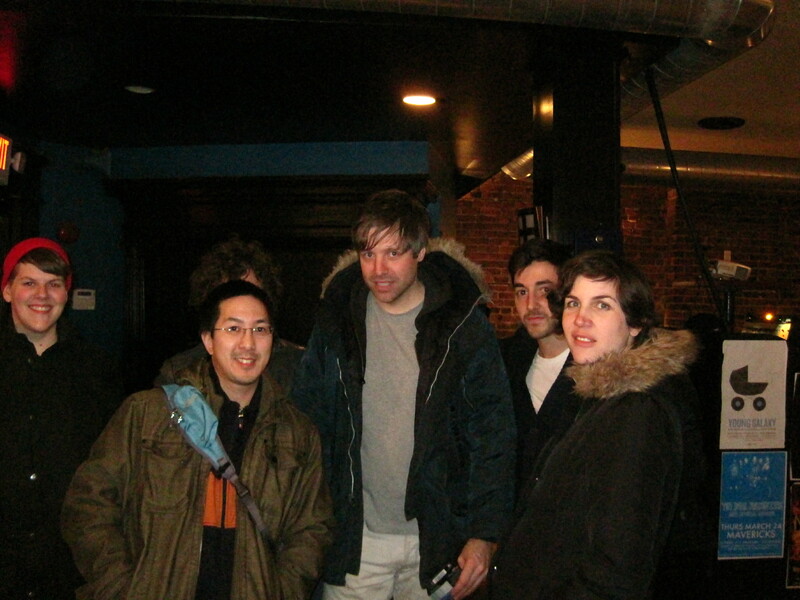 Pictured with Karkwa. 4:56pm. Ottawa mayor, Jim Watson is here. 5:03pm. Just saw Roger Cross, from 24. He went through the red carpet. 5:05pm. William Shatner is now here. 5:11pm. Laureen Harper has made it to the red carpet along with the Minister of Heritage. 5:13pm. Actor, Bruce Greenwood arrived to the red carpet. 5:27pm. Looks like the celebrities have all arrived to the red carpet. 5:35pm. Don McKellar has arrived. Done with the red carpet festivities. Made my way to the press room (around 6pm). Got to see winners from the team of Incendies. 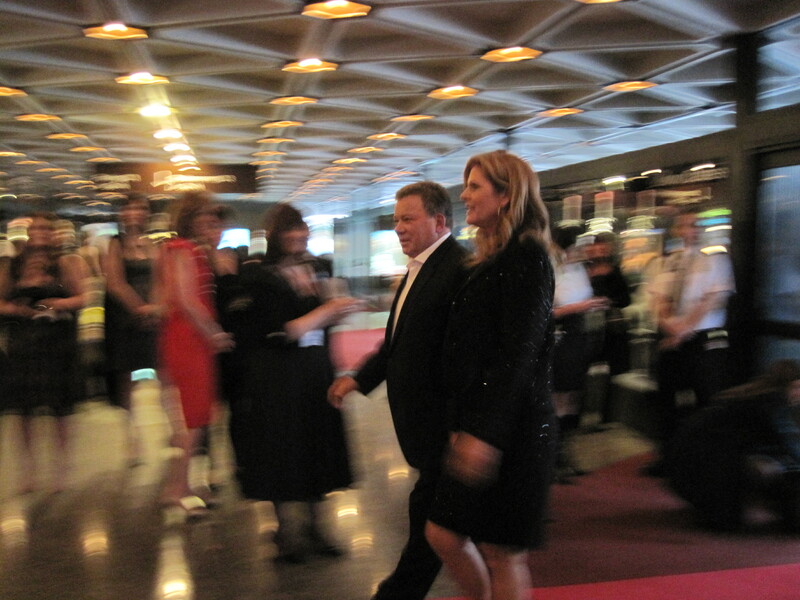 William Shatner made his way in the press room, post awards show. In closing, I had some nerves before going to the Genie Awards but I had great fun being at the Blogger Zone table and some of the celebrities were surprised and astounded with myself and two other people. It brought a unique element as the audience is catering to a tech crowd. The press room was pretty good with Wi-Fi but there were big time glitches with the audio from the awards ceremony, but it was eventually fixed up. The afterparty was a nice setting to see as celebs mingle around and trying out foods. It was a nice experience to attend a film award. I forgot to put a link of the Genie Award winners from any news source. Feeling a bit clumsy in leaving it out. The playlist is at this link. The Wild 10 Countdown entry is at this link. The March 9 radio show – press play to listen. I cannot believe February went by quickly and I know I did not mention about my birthday on the blog as I forgot about it. We’re already onto March and there’s several events coming up in terms of concerts and various activities in Ottawa. I’ve recovered from the cold, fever and sore throat as it seems like people have been sick during the final week of February. The photo shown on top was the Great Bloomers show which happened last Friday at Cafe Dekcuf. I had the opportunity to chat with the frontman of the band. The interview aired on the March 2nd radio show. Luckily, the co-hosts returned to the show after being absent for 2 weeks. I’m enjoying the Blue Microphones Yeti as the voiceover for Wild 10 Countdown was recorded on the mic. Hope you will like the minor change in quality. During the live part of the show, there were new tracks by Snailhouse and Kool Krys as they just released new songs and both are excellent! Both of them have ties to Ottawa. Finally played Montreal’s Domestic Crisis Group after the silliness in February from Chinese New Year to Chinese love songs and the change in a shortened program. I should keep track on what albums or singles that have caught my attention for remembering come year-end reviews and picks. I was late in the game in 2010 with the positive response to Beach House’s Teen Dream. The Naked & Famous – songs are Punching In A Dream and Young Blood. The album, Passive Me, Aggressive You has not been released in North America yet. The album is considered a 2010 release in their homeland of New Zealand. It’s still new for North American listeners. Lykke Li – Wounded Rhymes is the first time I picked up her album. I did not listen much from her first album. So far, I Follow Rivers has been my favourite track. British Sea Power – Their album, Valhalla Dancehall has caught my interest. Their sound ranges from the likes of Arcade Fire to Kings of Leon. So far, they’re getting good buzz. Tennis! – With the release of Marathon, their sounds bring up a 50s Pop feel and so far, the co-hosts have been enjoying them. The March 2nd radio show – press play to listen.